OTTENS - Nieuwe kaart van de graafschap Zeeland. . .
OTTENS, R. and J. - Nieuwe kaart van de graafschap Zeeland. . .
Nieuwe kaart van de graafschap Zeeland. . . - OTTENS, R. and J. Title : Nieuwe kaart van de graafschap Zeeland. . ..
Map maker : OTTENS, R. and J.. Date : Amsterdam, c. 1744. Size : 18.2 x 23.1 inches. / 46.3 x 58.6 cm. 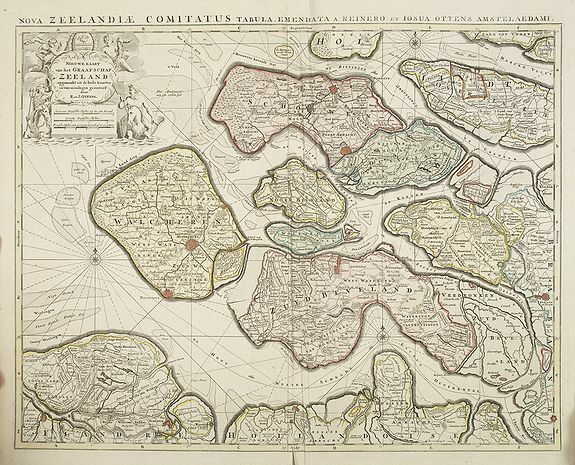 Description :Rare map of the Province of Zeeland, with its many islands and peninsulas. Major cities, small villages, and some of the natural features are named. Published by Reinier & Josua Ottens. The map has a second title along the top "Nova zeelandiae comitatus tabula. . ."
The Dutch Ottens firm of publishers assembled their atlases to order, the maps were often published separately. Condition : Printed on heavy paper. Good impression. In fine body colour, cartouches uncoloured as issued. Repair of a small marginal tear in lower part center fold, generally in good condition.